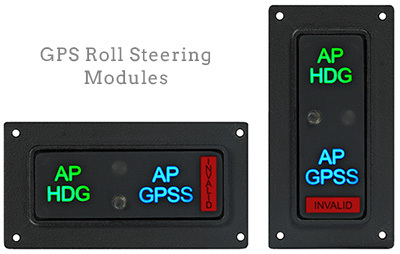 Century's GPS roll steering module makes flying with your GPS and autopilot easier than ever. GPS roll steering lets you program a complete flight plan into your GPS; and then with the push of a button the autopilot follows your flight plan turn by turn. It even anticipates the turn based on your ground speed and distance to the waypoint. Once activated all you need to do is moniter the aircraft and leave the navigation to your Century GPSS. By reducing your navigation workload you are able to greatly improve your situational awareness and safety in both VFR and IFR conditions. Annunciation comes in Horizontal or Vertical mounting configurations.